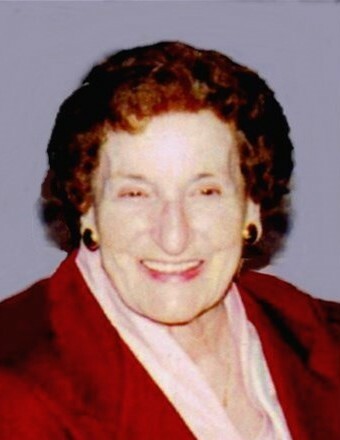 Theresa (Gemma) Pesaturo, 98, passed away on November 17th, surrounded by her loving family. She was a resident of Golden Crest Nursing Center in North Providence for the last several years, having previously made her home in North Providence. Theresa was the last of a family of 12 siblings. The Gemmas were a proud Italian-American family of 9 boys and 3 girls, who came to America from Arce, Italy – part of the wave of immigration to the “new world.” Her father Bernardo Gemma had come to Providence first, and was there to welcome his wife, Philomena, who made the journey, by ship, with 9 children. In Providence, she gave birth to 3 more children, Theresa being the youngest. On Providence’s Federal Hill, in a 3-story tenement, all 12 of them grew up. Money was scarce, but love and loyalty were anything but. The strong ties that bound the family together were unbreakable, even into their adult years. A beautiful example of these ties was evident five, even six decades after their childhood. On the first Monday of each month, the siblings and their spouses gathered to be together in the house they were raised in. This tradition continued not just for years, but for decades. Theresa was loving and loyal to her own family, without limit. She was married to the late Anthony Pesaturo for nearly 70 years. Mr. Pesaturo owned and operated Anthony’s Florist in Providence for many decades. She leaves a daughter Eileen Persechino and her husband Ernest, and two sons, Frederick Pesaturo and his wife Deborah and Anthony Pesaturo and former daughter-in-law Gaele Pesaturo Anderson. She was the mother of the late Anne Marie Pesaturo She leaves six grandchildren, Kelly Pesaturo Carello, Cory Pesaturo, Gregory Pesaturo, Ernest Persechino Jr., Linda Morang and the late Sherry Persechino. She also leaves eight great grandchildren, Matthew and Mackenzie Carello, Brady and Owen Pesaturo, Claudia and Camille Persechino, and Steven and David Grimaldi. She is predeceased by her brothers Albert, Alfred, Americo, Armando, Benny, Gino, Henry, Joseph and Nunzio Gemma, and by her sisters Amelia Andreozzi and Concetta Corsetti. Theresa didn’t travel the world or have the opportunity to earn a college degree, but her deep insight, sharp perception and uncanny intuition were undeniable. With a generosity of spirit, her collateral was praise, which she endlessly doled out to everyone around her. Selfless and devoted, she actively strove to keep family connected. In numerous, handwritten letters to family members living in other states, she didn’t just diligently report the latest news, but lovingly shared her wisdom and life lessons. With Theresa’s passing, the Pesaturo family has lost a matriarch, and the Gemma family has lost the last of a generation. In a wider context, Theresa was a part of the post-war wave of strength and industriousness that rebuilt America. The men and women of her generation built armies, skyscrapers and first-generation families, with an inextinguishable resolve. Her passing moves us closer to the poignant end of America’s greatest generation. Visitation will be held Wednesday Morning, November 21, 2018 from 8 a.m. - 9:15 a.m. in the Maceroni Funeral Home, 1381 Smith St., North Providence, followed by a Mass of Christian Burial at 10 a.m. in St. Pius V Church, Eaton St., Providence. Burial will be in St. Francis Cemetery, Pawtucket.